December 02, 2018 at 1:25 pm. Oklahoma captured the last spot in the College Football Playoff on the heels of Georgia’s loss to Alabama in the SEC Championship Game. The No. 4 Sooners (12-1), who won the Big 12 title on Saturday, will play the No. 1 Crimson Tide (13-0) in the Orange Bowl on Dec. 29. Alabama is vying for its second straight national championship and the sixth of the last decade under head coach Nick Saban. In the other semifinal, No. 2 Clemson (13-0) and No. 3 Notre Dame (12-0) will square off in the Cotton Bowl on Dec. 29. 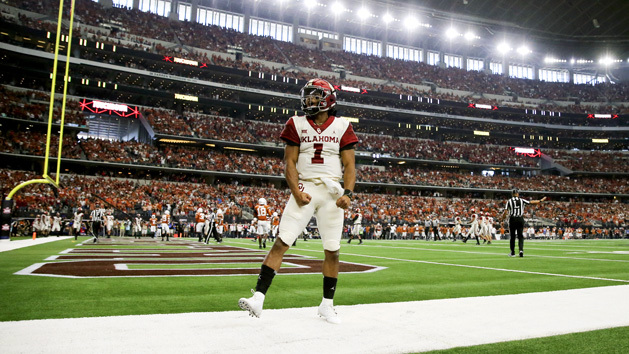 The national championship game will be played Jan. 7 in Santa Clara, Calif.
Oklahoma claimed a conference championship by posting a 39-27 win over Texas in the Big 12 title game. Georgia (11-2), who played in the national championship game last season, and Ohio State (12-1) finished Nos. 5 and 6, respectively in the final rankings. The Bulldogs, who dropped a 35-28 decision to Alabama, boasted a better strength of schedule than the Sooners and Buckeyes while Ohio State enjoyed the best strength of record of the three schools. Alabama is making its fifth consecutive appearance in the College Football Playoff while ACC champion Clemson will make its fourth straight. Notre Dame is entering the playoffs for the first time. The Fighting Irish lost to the Crimson Tide in the BCS national championship game in 2012.